A Life, Not As Advertised: Can you help #careforLaura crowdfund fund life-saving surgery for Laura's Ehlers Danlos syndrome? 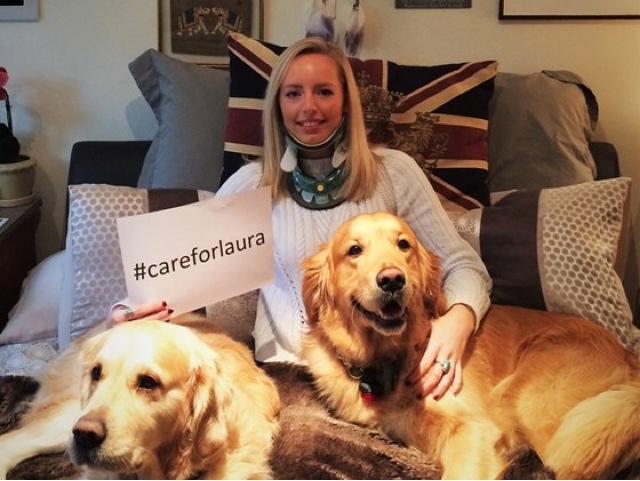 Can you help #careforLaura crowdfund fund life-saving surgery for Laura's Ehlers Danlos syndrome? As you may know, since 2013 have been disabled by the rare disease (or rarely diagnosed disease), Ehlers Danlos syndrome. I've been at rock bottom and have, with the support of my husband, managed to drag myself to a somewhat precarious place where I can work a few hours a day. Days out or meetings are always a knock back but I build the down-time in. I've know that I'm lucky to have got to my mid-forties before this genetic condition hit me with its full force. Recently, I was put in touch with another woman who lives close to me with the same condition. Laura Sylvester and I met for a coffee in Farnham, where she told me her story. Laura is just 23 years old, beautiful, smart and determined. A lover of sports, Laura was studying for a Masters degree at Imperial College, London, when EDS took hold. She became so unwell she had to pause her studies and return home to be cared for by her parents. Laura's condition has continued to deteriorate and her vertebrae are now so unstable, it's put her life at risk. She needs vital neurosurgery that is only possible from a particular surgeon. He happens to be in the US and so this is going to cost a lot of money. A lot of money that Laura and her family don't have. However, I mentioned that she is smart and determined, and so Laura has launched a crowdfunding campaign #careforLaura, to ask for people to help her reach her funding goal so she can have the surgery early next year. This will mean she will be able to resume her studies and, although she will still have EDS, she will have a shot of achieving her goal of becoming a geologist. Can you help #careforlaura?On 7th August 2014, I was diagnosed with a rare genetic disease called Ehlers Danlos Syndrome (EDS) with PoTS (Postural Tachycardia Syndrome). EDS causes the connective tissue throughout my body to be extremely stretchy and easily breakable - there is no cure for it. Over time, my muscles in my neck have become very unstable, which has further led to dislocation/subluxation of my vertebrae, disruption of my spinal cord ligaments, and compression on my cerebellar tonsils and brain stem. Suddenly my life was flipped upside down and this degenerative muscular condition caused me to deteriorate quickly, forcing me to postpone my Master’s degree at Imperial College, return home, and be cared for by my parents. Once an extremely sporty, sociable, positive and driven young woman, I have become tremendously vulnerable. I am in extreme pain, I wear a neck brace all day, and I am at constant risk of further damaging my brain stem, that would consequently cause me to stop breathing. I am in desperate need of specialised EDS neurosurgery which will be done on 13th January 2016 in Washington D.C., USA. There are few experts in the world who can do this. The total of the medical expenses, travel and recovery is very high. I hope and NEED to raise at least £75,000 ($110,000) to fund this. The surgery will create stability in my neck and stop the compression on the brain stem and cerebellar tonsils, essentially saving my life. This will enable me to carry on living my life as a normal 23-year-old, hopefully mostly pain-free and without the worry of causing further damage, which could otherwise prove fatal. Even though the surgery will offer me the stability that I need, unfortunately it comes at a cost of losing complete movement of my head and neck. Nevertheless, I am determined to adapt to this and begin fulfilling my dreams once again and resuming my Master's degree. Any amount of donations and support for this specialist neurosurgery will be so tremendously appreciated, not only by myself, but also my family and friends. Please do consider contributing to the first major stepping stone that I need to live my life without fear. Laura is now within £5000 of her target - an INCREDIBLE achievement in just two weeks. Can you help push her over the finish line? Click here to make a contribution, however small, it will help make Laura's Christmas fantastic and give her the chance of a New Year appointment with her surgeon!